A Liberal's Libretto: It's National Voter Registration Day! With Voter Registration Deadlines fast approaching in many states - it's now, or never. Let it be now because we all must vote. We must make our voices heard in this extremely important election. Please visit NationalVoterRegistrationDay.org or gottavote.com to find out how you can register and what documents you'll need on November 6th in order to make your voice heard! It is our fundamental right as Americans to participate in the election of our government. It is a key principle upon which our great country was founded. If we sit idly by and let a nervous political party corruptly muck-up our chances to take part in that vote ... if we allow them to bully us into not being allowed to cast our vote ... then, we have allowed them to adulterate our elections and we are, ultimately fulfilling somebody else's plan. 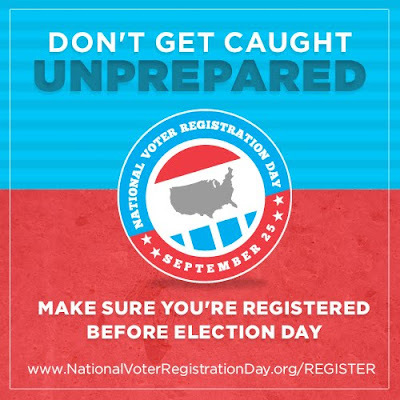 Again, and I can't stress this enough, please visit NationalVoterRegistrationDay.org or gottaregister.com to find out how you can register and what documents you'll need on November 6th in order to make your voice heard!